Tree frogs have an incredible ability to attach to a range of surfaces from smooth glass to rough wood in both wet and dry conditions. Julian Langowski, co-author of a new paper published in Frontiers in Zoology, takes us through the proposed mechanisms of tree frog attachment. The tree frog Hyla cinerea clinging to a smooth substrate. Even under challenging conditions such as wet and slippery substrate surfaces, tree frogs can stick to various substrates using soft pads on the tips of their toes. 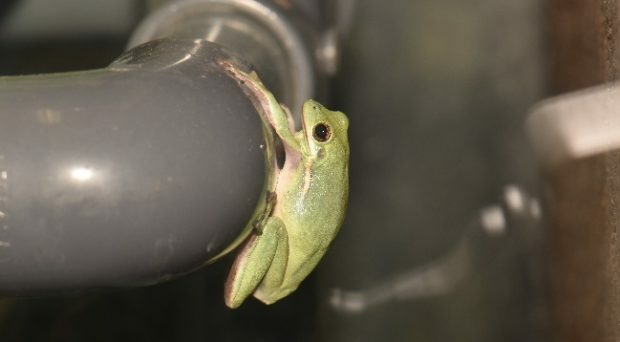 Getting a grip on tree frog attachment not only helps to unravel the evolution and ecology of these animals, but it also promotes the development of novel tree-frog-inspired applications such as wet weather tires and surgical grippers. After centuries of research, many crucial aspects of tree frog attachment have been identified, but a full understanding of the fundamentals of tree frog attachment is still missing. A new review by Julian Langowski of Wageningen University & Research and co-authors published in Frontiers in Zoology aims to provide an overview of research on tree frog attachment and explain the knowns and unknowns of the underlying mechanisms. Schematic overview of the surface pattern on a tree frog’s toe pad. Reprinted from: Langowski et al. (2018): Tree frog attachment: mechanisms, challenges, and perspectives. Frontiers in Zoology, 15:32. The toe pads show a characteristic surface pattern on their ventral side. Individual surface cells of the pad skin form polygonal pillars that are separated by a network of channels. The top of each cell is covered by ‘nanopillars’, which again are separated by channels, effectively forming a hierarchical micro- to nanoscopic pattern on the ventral pad epidermis. This pattern presumably reduces the effective stiffness of the pad. In fact, the pad has an effective stiffness in the order of 25 kPa, which is softer than most other biological materials. This presumably enables the pad to closely conform to the rough substrates found in nature. The high conformability of the toe pad may allow the generation of van der Waals forces – forces of attraction that arise when molecules are in close proximity – between the pad and the substrate, contributing to the attachment of tree frogs. We conducted a sensitivity analysis of the amount of generated van der Waals forces as a function of the distance between toe and substrate as well as the interaction strength between the two. The analysis suggests that the pads can conform closely enough to the substrate to generate a substantial amount of van der Waals forces. Moreover, the surface pattern potentially enables the frogs to use suction, as in the suction cups of cephalopods, and possibly mechanical interlocking, as in the claws of insects or in burdock seed. Additionally, tree frogs secrete mucus into the channel network on the pad surface which – next to regular functions such as thermoregulation, cutaneous respiration, and defence – presumably also aids in attachment. For example, the mucus forms a capillary liquid bridge in between pad and substrate. The prevalent theory is that this liquid bridge causes capillary adhesion, analogously to the force between two glass slides with water in between. The flow of mucus during pad movements may also cause hydrodynamic contact forces. However, current analytical models are not sufficient to quantify the contribution of the single mechanisms. Overview of the mechanisms which may contribute to tree frog attachment. It is likely that tree frogs do not rely on only one but on several of the aforementioned mechanisms, in order to ensure static and dynamic, adhesive and frictional, reversible, and repeatable attachment to a wide diversity of natural surfaces. Overall, tree frogs are a fascinating model system to study the complex interplay of mechanisms in a bioadhesive structure. For further progress in the understanding of this system, studies on the internal morphology of the pads (e.g. how is the adhesive surface linked mechanically with the internal skeleton?) and on the chemistry of the mucus (e.g. do tree frogs actively modulate mucus chemistry to control attachment?) are required. In a recently published study, we took a first step in answering these questions and found that the adhesive pad surface is connected to the internal skeleton by a collagen layer, which is suitable for the transmission of high shear loads. Addressing these questions can lead to an overarching model, which integrates the functional demands on the toe pads, the pad morphology, and the various mechanisms contributing to the attachment of tree frogs. Such a model may lead to new insights into the fundamentals of contact and attachment. Gaining insight into tree frog attachment can also contribute to a better understanding of other biological attachment systems (e.g. in geckos and insects) and to the analysis of the hypothesised convergent evolution of these systems. Finally, knowledge on the attachment of tree frogs is expected to stimulate the development of a wide array of bio-inspired adhesive applications that are as versatile as the toe pads of tree frogs. Julian K.A. Langowski has a MSc in biomimetics and is currently PhD candidate at the Experimental Zoology Group (EZO) at Wageningen University & Research (WUR), The Netherlands, under the supervision of Johan L. van Leeuwen, EZO, Dimitra Dodou, BioMechanical Engineering, Delft University of Technology, The Netherlands, and Marleen Kamperman, Physical Chemistry and Soft Matter, WUR. Julian is fascinated by the complex attachment system of tree frogs and uses a multidisciplinary approach to study the properties, mechanisms, and the biomimetic potential of tree frog attachment. He shares his interest on the exciting field of bioadhesion with others at kermitsstickylittlefingers.